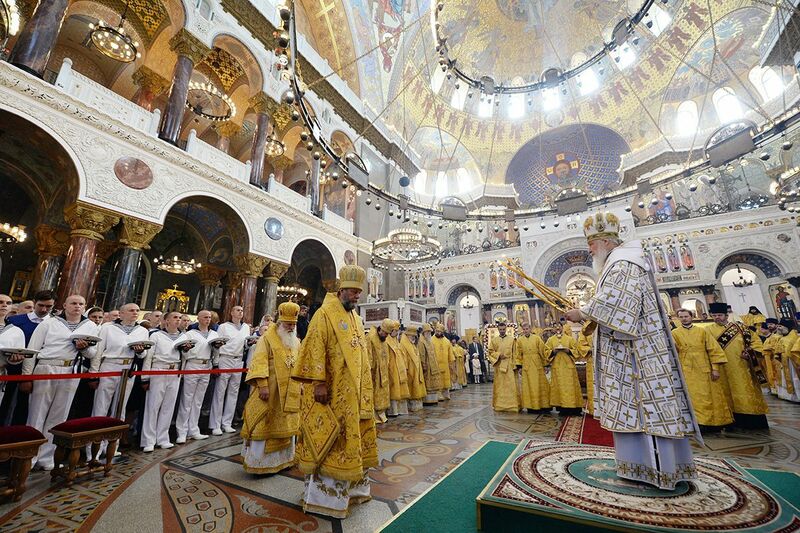 30 July 2017, on the 8th Sunday after Pentecost, His Eminence Metropolitan Vladimir concelebrated to His Holiness Patriarch Kirill in the St Nicholas stavropegial Cathedral of Kronshtadt, the central ecclesiastic edifice of the Military Marine Fleet of the Russian Federation. Traditionally, on the last Sunday of July, the day of Marine Fleet is celebrated. Kronshtadt Cathedral gathered numerous church-goers who came to pray together with the arch-pastors of the Church, for the repose and forgiveness of sins of all faithful mariners, fell in mission for the defence of the Motherland. After the Divine Liturgy, Metropolitan Vladimir bowed in veneration before the shrine with the relics of St. Fyodor Ushakov (Admiral and heavenly protector of mariners) and the shrines with particles of relics of Holy Apostle Andrew the First-Called and St. Nicholas of Myra, after which had a discussion with the veterans. It should be mentioned that in 1970-1973, His Eminence Vladimir performed compulsory military service in the Black Sea Fleet, and is honourable member of the Association of Military Marine Fleet of the Republic of Moldova. Synodal Sector of Institutional Communication and Relations with the Mass-Media.